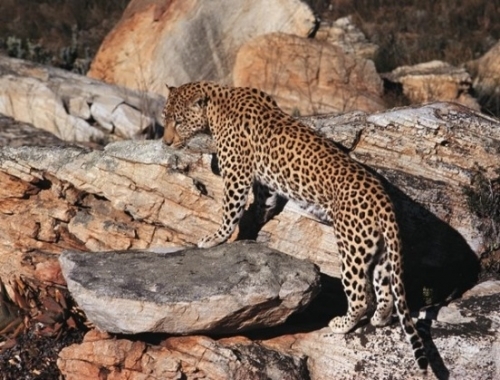 The Cape Mountain Leopard - just one of many dangers that the postwoman (yes, that is right!) had to contend with on her bi-monthly postal delivery route between the two remote outposts between the Cederberg and the Tankwa Karoo. It took us 8 years to get to this one. For no other reason that's a damned long drive to do in one day. Finally, we filmed the 53 km route from west to east and produced an 8 x 5 minute video set, which takes around 40 minutes to watch. The route is essentially a Grade 1 in 4x4 terms, but could deteriorate (in places to a Grade 4 or even a 5) in bad weather. There are two gravel passes on the route (Kraaiberg and Karretjies) and several impressive canyons (Kliphuiskloof and Bobbejaanskloof), but other highlights are the crossing of the Doring and Tra-Tra rivers and if you get your timing right, a visit to the Achterfontein farm, could include a rooibos tea tour. Unfortunately a fair bit of our footage shows a two spoor track running across bleak and burnt plateaus after a massive fire raged through the area just a few days before our trip. As usual we will keep the page open to Wild Dogs members until Thursday next week. The videos contain a vast amount of information on the flora, fauna, history and other interesting snippets on both the Cederberg and the Tankwa Karoo. Whilst this trip won't challenge experienced adventure motorcyclists much, it is a fascinating and interesting journey, offering lots of variety in a timeless landscape, where you can truly 'escape'. The page contains accurate directions of every intersection and access point. Thanks for the info shared Trygve. I think Dennis, Dave and I passed you on Saturday morning as we headed in the opposite direction on our way to to Katbakkies and onto the padstal. Had dinner with Dennis and Yvonne last night and he confirmed this. Such a nice biker road up there.